On February 1st 2008 the ham radio equipment aboard ISS was switched to operate as a crossband FM repeater. The uplink frequency is 437.800 MHz and the downlink frequency is on 145.800 MHz. You can hear multiple stations from Europe on the enclosed recording from DD1US dated Feb 1st 20:15h UTC. 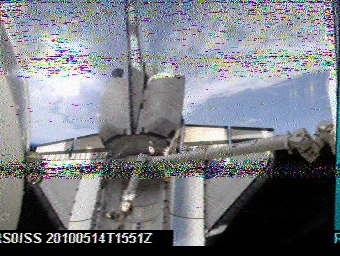 At the same day the downlink was also recorded by KF6KYI (February 1st 2008). Please note, that at other times an uplink frequency of 437.050 MHz with the same downlink on 145.800 MHz was used. About 25 years after his father, Dr. Owen Garriott W5LFL, operated the first amateur radio station in space, his son Richard Garriott W5KWQ visited ISS as a space tourist for 10 days in October 2008. He started his journey with the launch of Soyuz TMA-13 on October 12th and returned back to Earth with Soyuz TMA-12 on October 24th 2008. Richard dedicated much of his time operating an amateur radio station using his personal callsign W5KWQ as well as the callsigns NA1SS and RS0ISS. 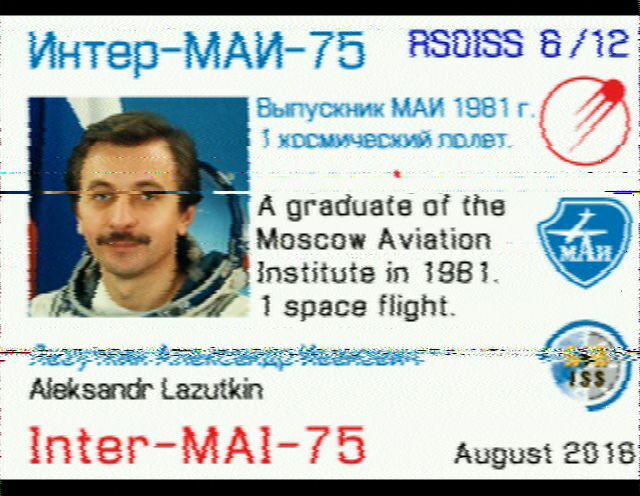 Besides talking randomly to other ham radio operators around the globe and having scheduled contacts to 4 schools he also transmitted SSTV (slow scan television) pictures from ISS back to Earth. Enclosed SSTV pictures which were transmitted on 145.800 MHz on FM were received and kindly provided by Nils von Storch. Richard Garriott was recorded using his personal callsign W5KWQ on October 16th 2008 at 09:10 UTC by Nils. Richard Garriott was recorded using the callsign NA1SS on October 16th 2008 at 13:53 UTC by Nils. This scheduled contact with Budbrooke School in UK was recorded on October 17th 2008 at 11:08 UTC by Nils. 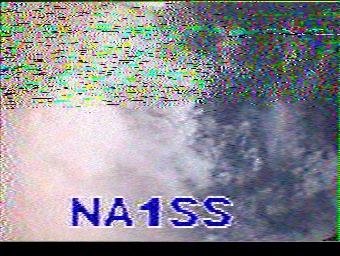 This voice and SSTV transmission was recorded on October 18th 2008 at 11:34 UTC by Nils. On October 18th 2008 at 19:41 UTC Richard had a number of contacts with stations in South America (including PS8ML, PY4AJ, PS8RF). Recorded and kindly provided by Piraja PS8RF. 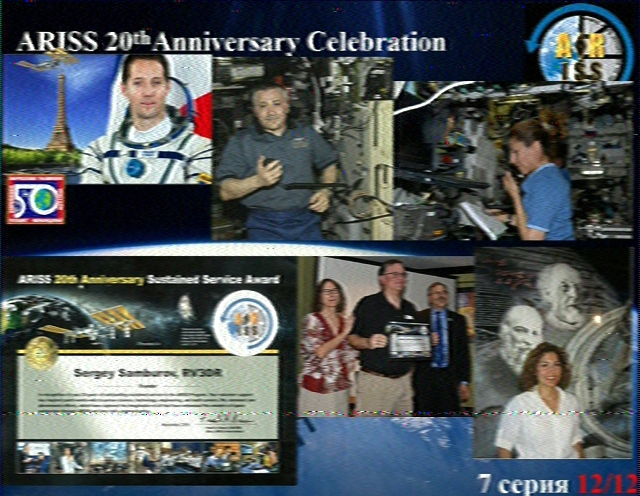 This contact of Richard Garriott (using the callsign RS0ISS) with RK3BCB as well as enclosed SSTV picture using the callsign NA1SS were received on October 19th 2008 at 12:04 UTC by Eyke DD1KE. Finally Nils recorded this transmission of Richard Garriott on October 21st 2008 at 08:07 UTC. 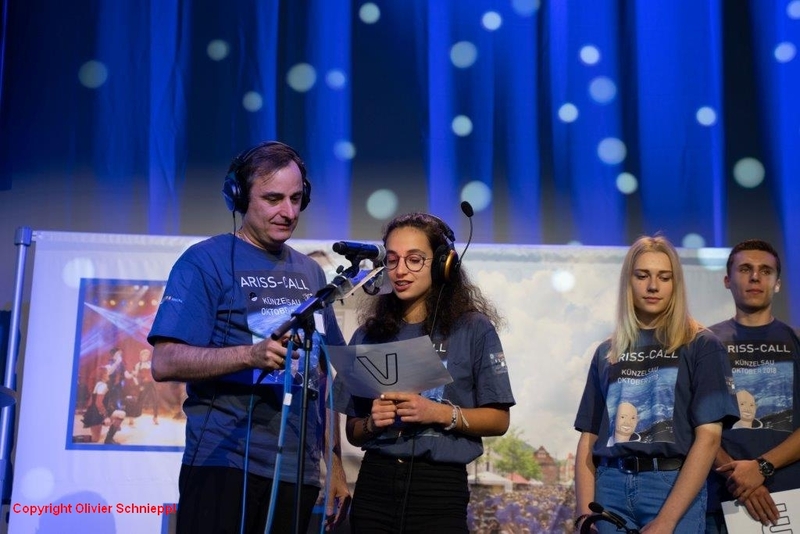 Michael Fincke (KE5AIT) used the callsign NA1SS when he had a scheduled contact with pupils of Ecole & Collège Jean XXIII, Pamiers, in France. They used the callsign F0CUQ. Recorded on January 30th 2009 at 13:12UTC on 145.800 MHz by Nils. Astronaut Sandra Magnus on board the ISS had a scheduled contact with Pilton The Bluecoat Primary School in Barnstable, England (callsign G0NPV). Sandra used the callsign OR4ISS. Recorded on February 6th 2009 at 14:55UTC on 145.800 MHz by Nils. In 2009 space tourist Charles Simonyi KE7KDP visited ISS second time after having been there already in April 2007. He had a scheduled contact (using the callsign OR4ISS) with Milwee Middle School in Longwood, Florida via the gateway ON4ISS. Recorded on April 1st 2009 at 17:56UTC on 145.800 MHz by Andy G0SFJ. In preparation to this contact Dave AA4KN created the attached slideshow in order to explain the pupils the mission. Please note that it is 36MB large ! Enclosed random contact of Charles with PD0RKC was recorded on March 19th 2009 by DD1US. On April 4th 2009 Charles made a number of random contacts with stations in Hungary using the callsign NA1SS. Recorded on April 4th 2009 by DD1US. 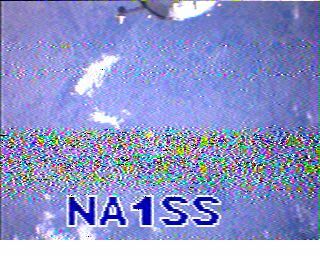 Charles used the callsign NA1SS during this contact with a Technical School in Hungary. 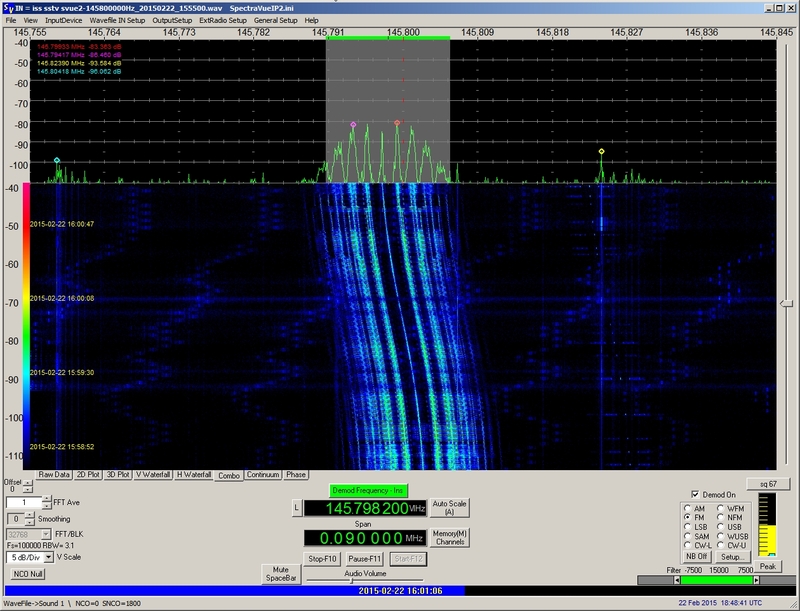 Recorded on April 5th 2009 14:57-15:06 UTC on 145.800 MHz by DD1US (quiet periods were cut out of the recording). On April 17th 2009 there was a scheduled contact of Koichi Wakata with Ulvila Upper Secondary School, Ulvila, Satakunta, Finland. 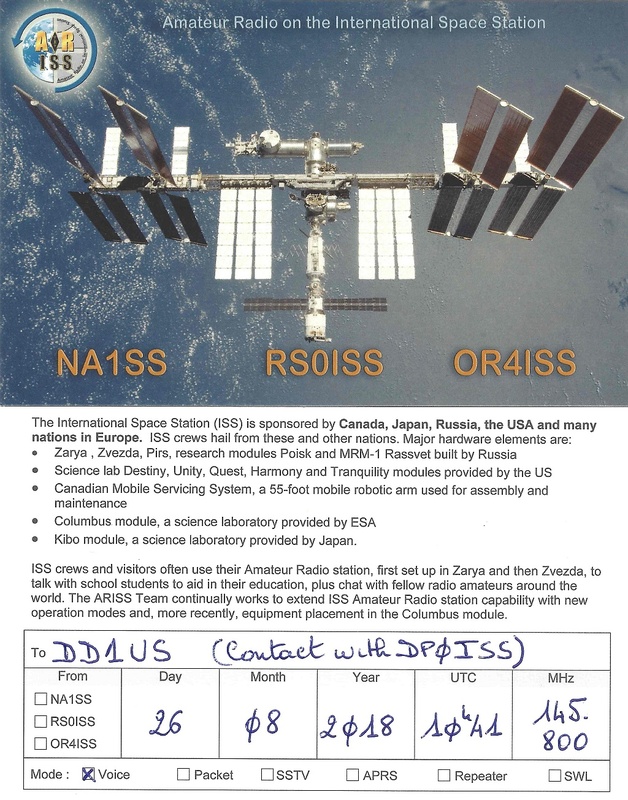 Koichi-san used the callsign OR4ISS while in contact with OH1F. Recorded on April 17th 2009 on 145.800 MHz by DD1US. 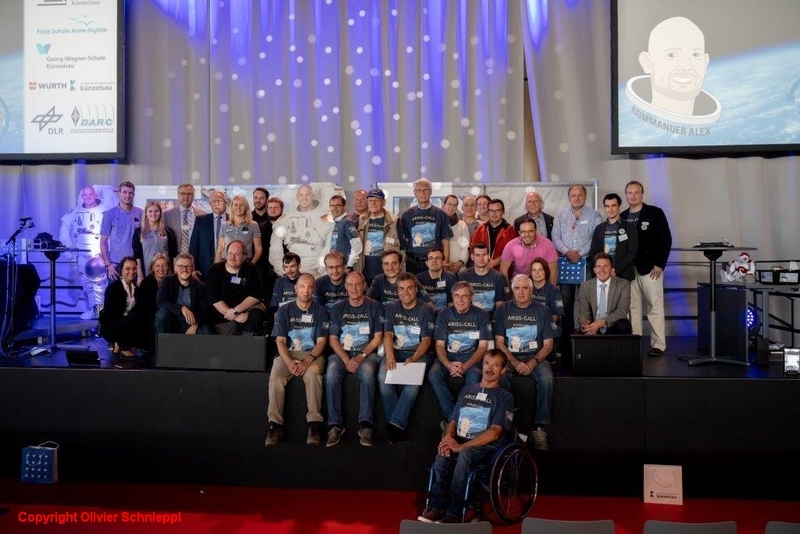 On June 12th there was a scheduled contact of belgian astronaut Frank de Winne (ON1DWN) with Liceo Scientifico “A. Bafile”, L’Aquila, Abruzzo, Italy. The contact with Frank (using the callsign OR4ISS) was established via IZ6BAJ. Children from several schools which were damaged during a large Earthquake in April 2009 attended this special event. It was hoped that the contact with ISS would re-motivate the students and give them a wider look on their future. Recorded on June 12th from 08:30-08:36 UTC on 145.800 MHz by DD1US. 1. How did you feel during the shuttle launch? 2. How does the earth look like from the station and is it possible to recognize buildings on Earth from the ISS? 3. Beside the sun, the earth, the moon, what other planets can you see from ISS? 4. Can you take a bath or a shower in the ISS? 5. Is it tiring to move at zero gravity? 6. Why do the astronauts have to clean the ISS periodically every week? 7. What was the hardest job you have done at the station? 8. How is security provided for oxygen supply? 9. What kind of space food do you like best? 10. How do you deal with the garbage in the ISS? 11. Where do you keep your dirty laundry? 12. Which standard time are you using in the ISS and how do you know if it is day or night and when it’s time to sleep? 13. Do you snore more or less in weightlessness of Space than you do on Earth? 14. What happens if someone in the station gets extremely sick or severely injured? 15. What kind of experiments are you making at the station and what is your mission in the space station? 16. We know that you work very hard in space. What do you do to relax and have fun? 17. What did you astonish most in the space? 18. Do you get homesick in space? If so, how do you deal with it? 19. How do you prevent your food from flying away in zero gravity? 20. Has space garbage crashed with the ISS? Recorded on July 19th from 17:55-18:07 UTC on 145.800 MHz in FM by DD1US. 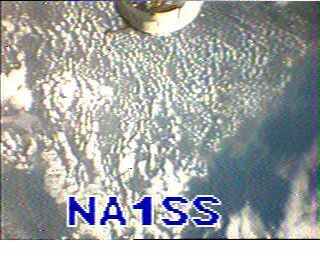 On August 4th 2009 ISS transmitted SSTV (slow scan television) pictures using the callsign NA1SS. The used format was Robot36. The 2 audio files were received on August 4th 2009 at 13:35UTC on 145.800 MHz in FM by DD1US. 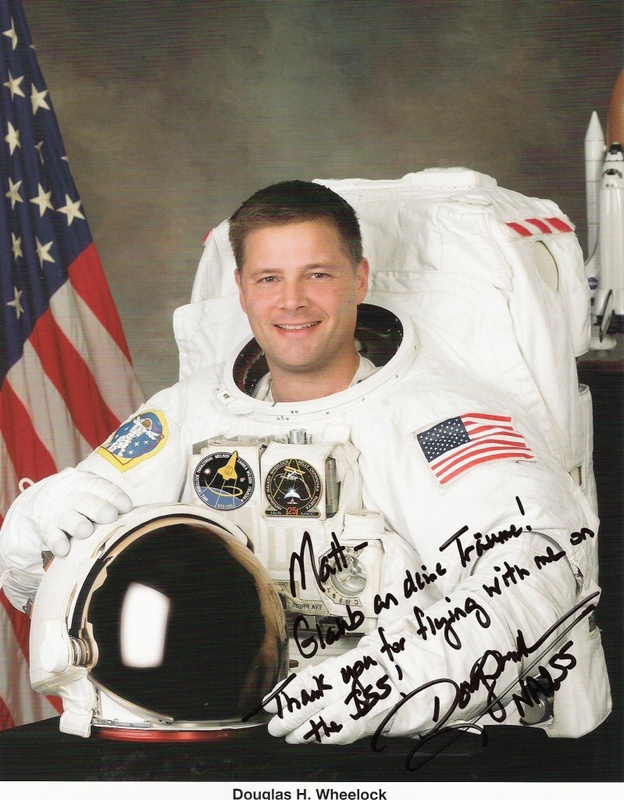 On August 5th 2009 there was a scheduled contact of US astronaut Mike Barratt (KD5MIJ) with the United Space School in Texas/USA. The contact was a telebridge via ON4ISS in Belgium while the space shuttle was over Europe. Recorded on August 5th 2009 from 13:55-14:02 UTC on 145.800 MHz in FM by DD1US. 14th 2010 from 15:50 to 15:57 UTC on 145.800 MHz in FM / Martin 1 mode by DD1US. Enclosed random contacts of Douglas H. Wheelock using the callsign NA1SS with ?? ?ADL, ON4HF, DD1US and DG0OJG were recorded on the downlink frequency 145.800 MHz on July 7th 2010 at 15:58 UTC by DD1US. Pauses in the downlink signals were removed from the recording to compress the file. I had another nice contact with Douglas H. Wheelock NA1SS on the same evening after a contact of Fabiano CT7ABD in Lisbon. Recorded by DD1US on July 11th at 20:45 UTC. Pauses in the downlink signals were removed from the recording to compress the file. On August 25th 2010 Fabiano CT7ABD/PY5RX received a very special birthday gift from the crew of ISS: Douglas H. Wheelock, Alexander (Sasha) A. Skvortsov, Michail (Misha) B. Kornienko and Fjodor N. Yurchikin were singing "Happy Birthday" for him. The recording of this special event was made on August 25th 2010 at 20:53 UTC by CT1EAT and kindly provided Fabiano CT7ABD. On August 29th 2010 Douglas H. Wheelock NA1SS made a number of random contacts over Europe. Callsigns he confirmed were PE1PIX, DD7VW, ?AVR, UA3VR. Recorded on August 29th 2010 between 19:40 and 19:45 UTC on 145.800 MHz by DD1US. Pauses have been removed. When the crew in ISS is not active in phone then quit often they activate the packet radio equipment. You can then hear the downlink of the digipeater / mailbox on the used simplex frequency 145.825 Mhz. Enclosed 3 minutes recording of the packet radio signal was made on September 4th 2010 at 20:50 UTC by DD1US. On June 11th 2011 I had the pleasure to meet Dough Wheelock in person and hand him over my QSL cards for the contacts which we had during his ISS mission. 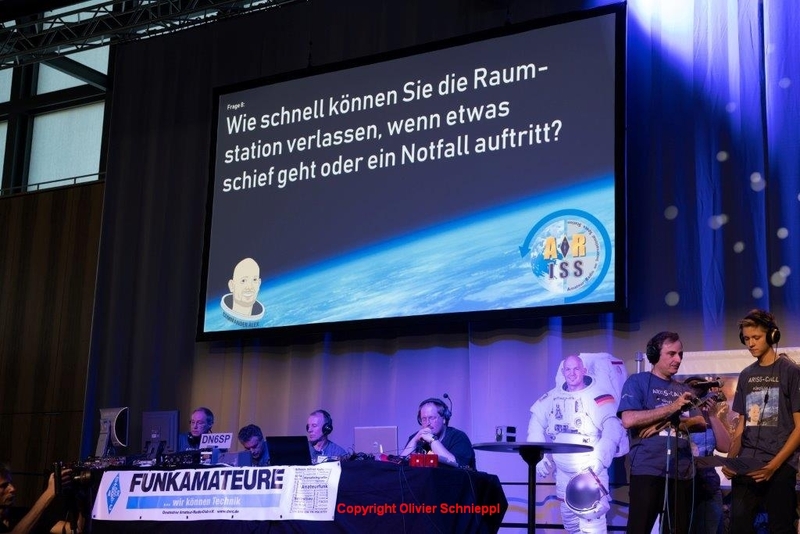 During the 20 people get-together including his German relatives in the Technik Museum in Speyer he showed videos and told a lot of interesting and humorous stories about his ISS mission. He also answered a lot of questions and during the more than 2.5 hours meeting we had time for private talks about ham radio and the famous "Happy Birthday song" mentioned above. If you click on the pictures on the right you will get larger versions. On December 15th 2010 italian ESA-astronaut Paolo Nespoli (private callsign IZ0JPA) started his 2nd mission to ISS. This mission called "MagISStra" is planned to last 6 months. Paolo returned safely to Earth on May 24th 2011 using Sojus TMA-20. 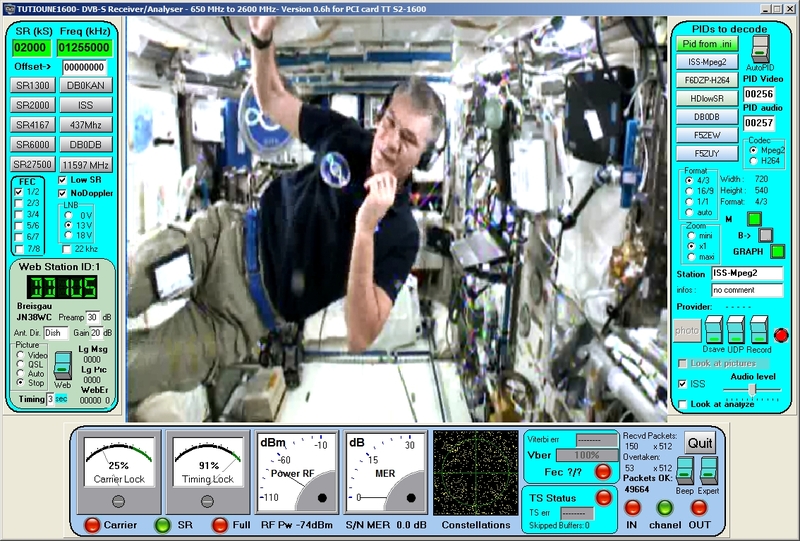 Enclosed contact of Paolo Nespoli with a school in Italy was recorded on the downlink frequency 145.800 MHz on January 15th 2011 at 09:04 UTC by DD1US. Enclosed random contacts including EA1GGK, IW2EHJ, IL3JPN, I7PQD, HB9OAB, I25BRW of Paolo Nespoli IR0ISS were recorded on the downlink frequency 145.800 MHz on January 23rd 2011 at 11:05 UTC by DD1US. Pauses were removed to reduce the size to about 30%. 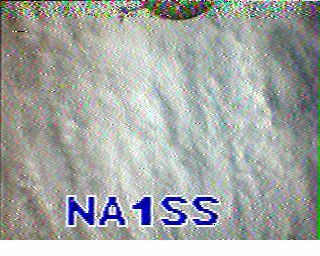 Enclosed contact of Paolo Nespoli IR0ISS with a school in Italy was recorded on the downlink frequency 145.800 MHz on January 29th 2011 at 10:31-10:38 UTC by DD1US. Some longer pauses were shortened to reduce the size. This is another contact of Paolo Nespoli IR0ISS with the school Scuola Media Statale "Francesco d'Assisi" using the callsign IZ7RTN. The contact was recorded on the downlink frequency 145.800 MHz on March 12th 2011 at 10:26-10:33 UTC by DD1US. 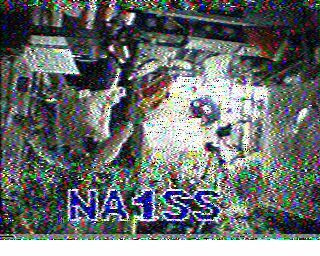 This is a contact of Paolo Nespoli IR0ISS with IW3QKU and IK0USO. The contact was recorded on the downlink frequency 145.800 MHz on March 19th 2011 at 10:18 UTC by DD1US. Some pauses have been cut out. 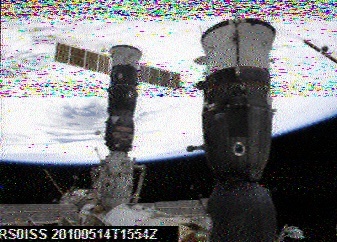 Enclosed recording of the downlink signal from ISS was recorded on May 14th 2011 from 09:07 - 09:13 UTC on 145.800 MHz. It is another school contact of Paolo Nespoli IR0ISS with IK0USO. Recorded by DD1US. Some pauses have been cut out. Catherine Grace "Cady" Coleman KC5ZTH participated in two space shuttle missions (STS-73 "Spacelab" in 1995 and STS-93 in 1999) before she started her long mission on ISS from December 17th 2010 until May 24th 2011. Cady's husband Josh Simpson is a famous artist creating glass sculptures. I especially like his paperweight series "inhabited planet" and have one of them here in my radio shack (see picture on the right). On February 2nd 2011 Cady at 06:32 UTC KC5ZTH had a ham radio contact with Buehl Realschule in Dornstadt/Germany using the callsign DN1WOL. 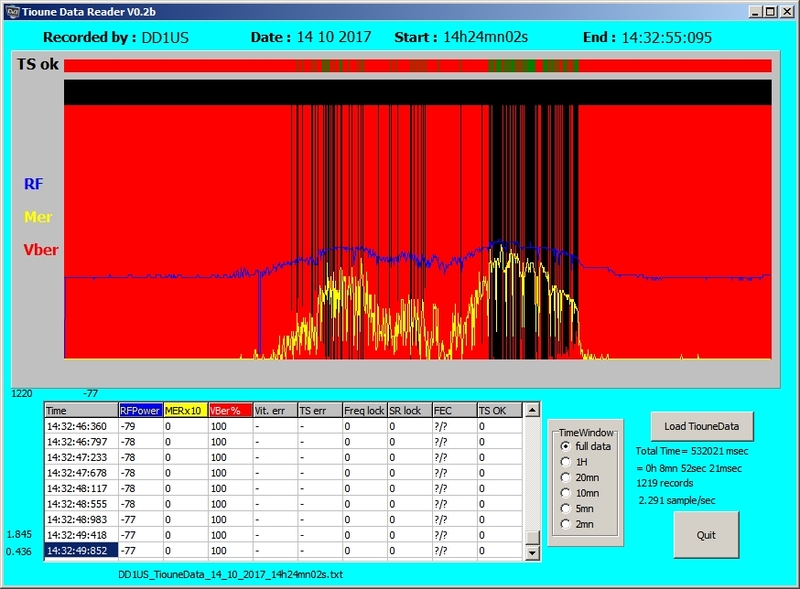 During the 8 minute conversation with students of the school her downlink signal was received and recorded by Guenter OE8GMQ. Thanks to Guenter for kindly providing the recording. Catherine returned safely to Earth on May 24th 2011 using Sojus TMA-20. 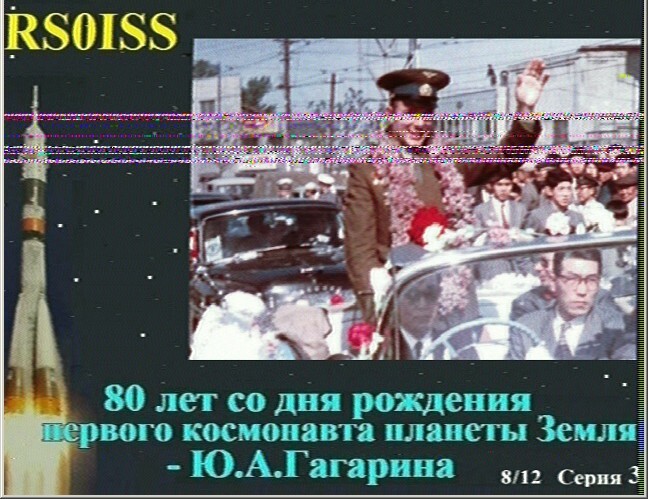 Enclosed signal of russian language from ISS was received on May 28th 2011 at 05:10 UTC on 145.800 MHz in FM. I do not yet know who was the Russian operator (maybe Commander Andrey Borisenko or Flight engineer Alexander Samokutyaev) but will add this information once available. Recorded by DD1US. Michael Fincke (KE5AIT) was also part of the space shuttle mission STS134, which was also the final flight of space shuttle Endeavour. 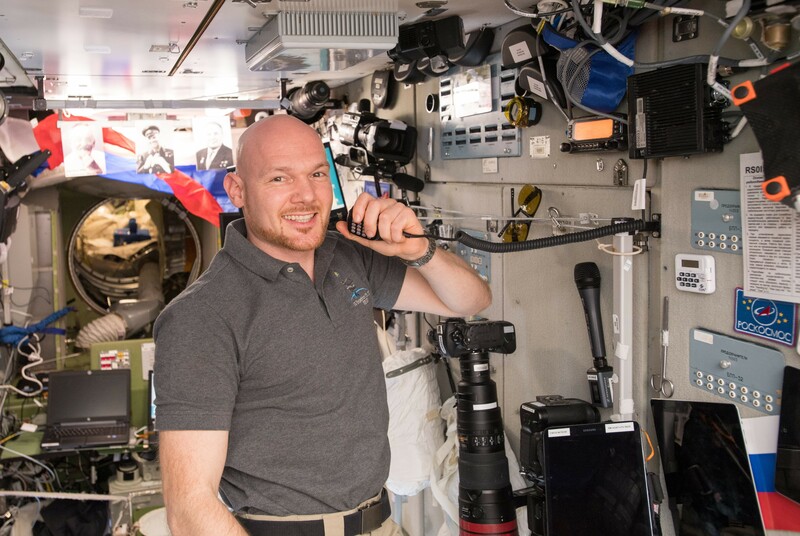 During his stay onboard ISS he also activated the ham radio station and used the callsign NA1SS. Based on the poor signal strength I strongly suggest that he used the ham radio equipment in the Columbus module. He made a number of random contacts on May 28th 2011 at 08:20 UTC. Received and recorded by DD1US. On July 23rd 2011 Mike Fossum ( KF5AQG) had a scheduled school contact with the European Space Agency (ESA) Space Camp 2011 in Pisa/Italy. Mike used the callsign OR4ISS while people at the space camp including ESA-astronaut Paolo Nespoli were using the callsign IQ5WR. 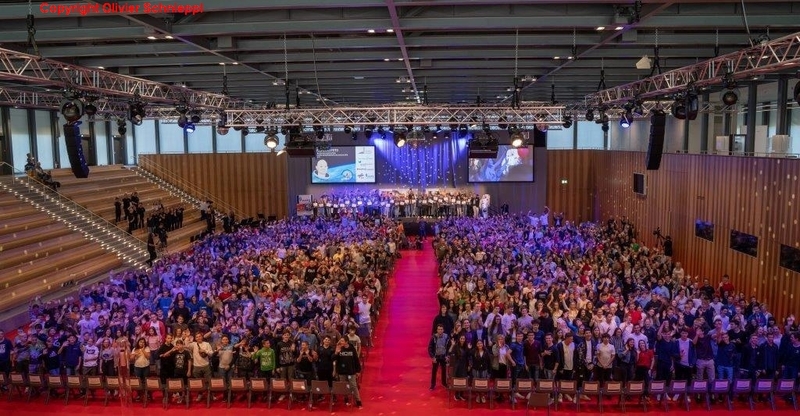 Approximately 150 children from all over Europe attended this camp to participate in a program of sports, nature and science and space activities. Received and recorded on July 23rd 2011 at 09:46-09:53 UTC on 145.800 MHz by DD1US. On October 31st 2011 Mike Fossum ( KF5AQG) had a scheduled school contact with Kantonsschule Zug in Switzerland. Received and recorded on October 31st 2011 at 14:55-15:02 UTC on 145.800 MHz in FM by DD1US. 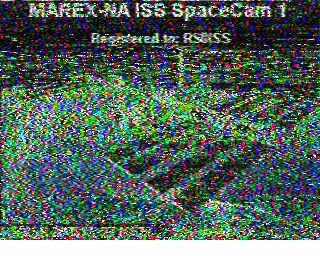 On September 17th 2011 I monitored enclosed downlink signal in Russian language from ISS. I suppose this is the voice of Sergei Volkov. Received on September 17th 2011 at 08:59-09:03 UTC on 145.800 MHz in FM by DD1US. 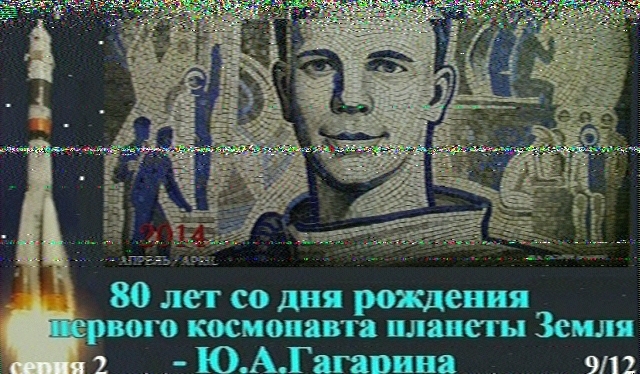 On February 25th 2012 I monitored enclosed downlink signal in Russian language from ISS. This is most likely the voice of Anton Shkaplerov, one of the three Russian cosmonauts. The other cosmonauts on board were Anatoly Ivanishin and Oleg Kononenko. This was a scheduled school contact with UFA State Aviation Technical University in Ufimskiy, Russia. 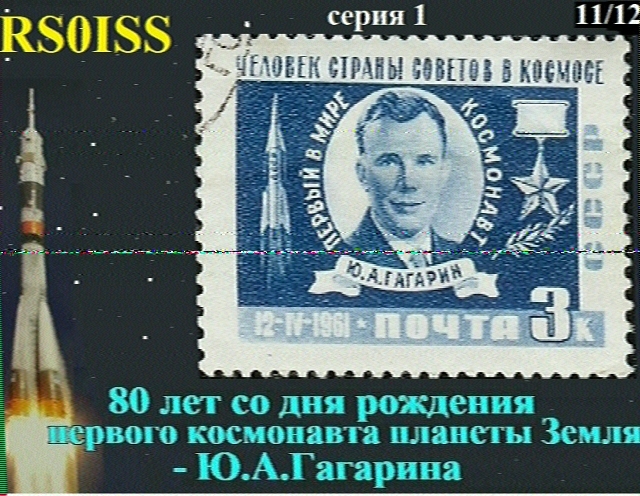 Received on February 25th 2012 at 14:47-14:50 UTC on 145.800 MHz in FM by DD1US. On February 26th 2012 at 17:00 UTC I monitored on 145.800 MHz in FM enclosed downlink signal. You can first hear Andre Kuipers using the callsign PI9ISS and talking in Dutch with PD9FER. It is his second stay on ISS. Later you can also hear one of the Russian cosmonauts, probably Anton Shkaplerov, calling a station in Russia. Long pauses have been removed, recorded by DD1US. At the same day during the next pass I monitored Andre Kuipers PI9ISS again. He was calling CQ and then confirming the callsign EA1JM. Long pauses have been removed. Received and recorded February 26th 2012 at 18:35 UTC on 145.800 MHz in FM by DD1US. The next day Andre Kuipers had a school contact with participants of ESA-ESTEC, Noordwijk, Netherlands. The following schools were included: American school of the Hague, International School of Amsterdam and The British School in the Netherlands. Unfortunately my recorder did run out of batteries and thus you will find enclosed only a short snippet which was recorded on February 27th 2012 at 12:48 UTC on 145.800 MHz in FM by DD1US. 1. What is the best part of being an astronaut? 2. How does your typical day look like, do you have any rituals? 3. Do you have free time and how do you spend it? 4. Do you feel time, when there isn't night and day? 5. What kind of food do you miss most? 6. Can you imagine that a person without "NASA-training" can live on the space station? 7. What is the most difficult thing to get used to in microgravity and for what reason? 8. Which experiments are currently being conducted by the crew? 9. Is there a special sleeping-room? 10. How long can you stay outside the ISS doing repair works? 11. What does it feel like to be in outer space? 12. Is there any difference between observing comets or falling stars from the ISS or from the earth's surface? 13. Is it possible to observe really strong thunderstorms from the ISS? Received and recorded by DD1US. 1. What was the most interesting scientific project you were involved in at the ISS? 2. Is living in space living up to the expectations you had on earth? 3. Did some things in space surprise you or were you prepared for everything by the training on earth? 4. What was the biggest accident or mishap during your time on the ISS? 5. Are you able to follow major sport events, for example the super bowl? 6. Is zero gravity fun or does it get annoying after some time? 7. How do American astronauts vote for the president? 8. Are there some things that are really annoying on ISS? 9. Do you miss things from earth on ISS? 10. How is sleeping at zero gravity? 11. How do you spend your free time? On October 8th 2013 at 19:52 UTC Fabiano CT7ABD/PY5RX made a very nice contact with ESA astronaut Luca Parmitano KF5KDP who was using the callsign IR0ISS. The recording was made and kindly provided by Fabiano CT7ABD. Auxiliary backup frequency: 2437.0 MHz. The HamTV equipment was carried to the ISS on the Japanese HTV-4 spacecraft which was launched on August 3rd 2013 and docked to ISS on August 9th 2013. 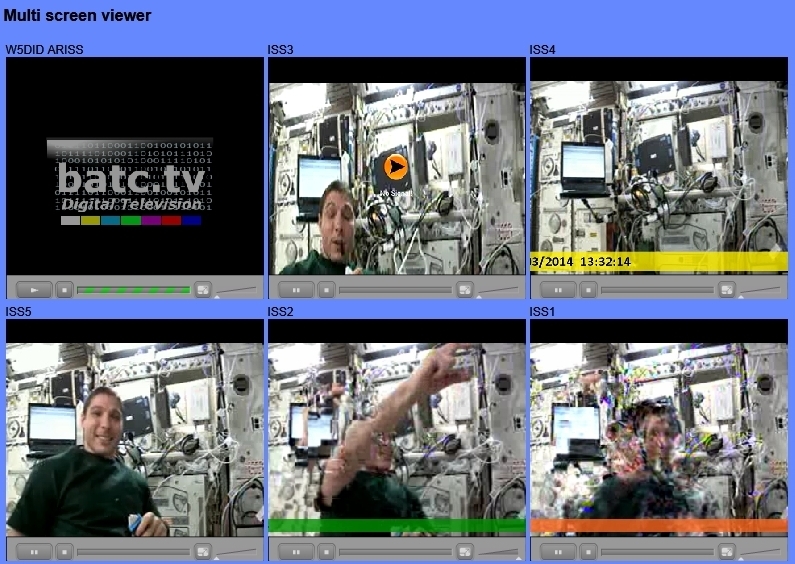 On Saturday March 8th 2014 at 12:27 UTC the DATV (Digital Amateur Television) on ISS was activated for the first time. Astronaut Michael (Mike) Hopkins, KF5LJG, operated the equipment. 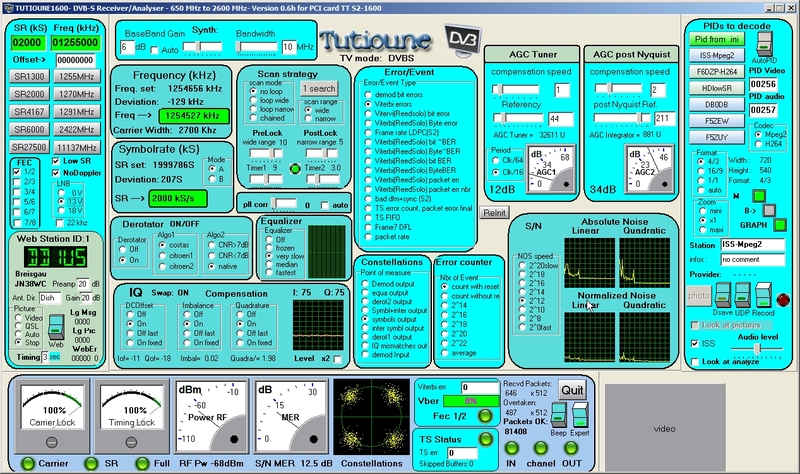 The transmission 2442 MHz in DVB-S2 1.3 Msps was received by multiple stations in Europe and streamed via the B ATV server. 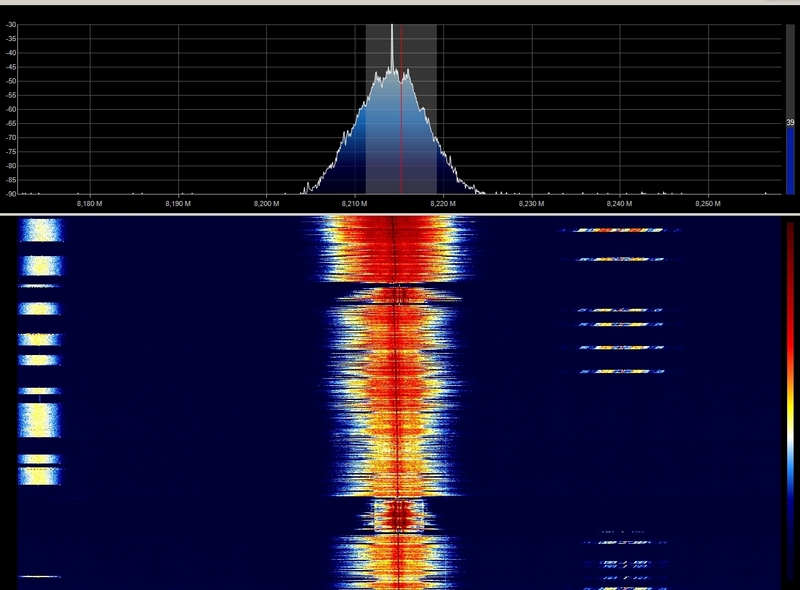 Enclosed some screenshots from the BATV server which show in parallel windows the DATV transmissions received by multiple amateur radio ground stations. Mike operated the equipment also the next day, Sunday March 9th 2014 before he returned back to Earth on Monday. On May 29th 2014 a new crew consisting of German Flight Engineer Alexander Gerst, Commander Maxim Wiktorowitsch Surajew and Flight Engineer Gregory Reid Wiseman reached ISS. Alexander Gerst did grow up in Kuenzelsau/Germany very close to one of my homes. His grandfather was the founders of the local Ham Radio Club DARC P33 and that's one of the reasons why Alexander got interested in science. 1. What made you want to become an astronaut? 2. How did your family react about your plans to fly into space? 3. How often do you have contact with family and friends? Received on 145.800 MHz and recorded by DD1US Matthias. On Wednesday July 2nd 2014 at 12:05 UTC Alexander Gerst DP0ISS had a school contact with DLR Project Lab, Neustrelitz, Germany. The downlink signal from ISS was quite weak. On Saturday July 6th 2014 at 14:10 UTC Alexander Gerst DP0ISS called Alfred DK9SV several times. Unfortunately on contact got established. The downlink signal from ISS was quite weak. On Saturday August 16th 2014 at 16:25 UTC Alexander Gerst DP0ISS had a contact with Alfred DK9SV, Rudi DL5TQ and Hans DL5SEA all member of the DARC OV P33 which was founded by Alexander's grandfather. Enclosed recording of the contact was kindly provided by Hans DL5SEA. Samantha Cristoforetti IZ0UDF is Italy’s first female astronaut and left Earth on Sunday, November 23rd 2014 at 21:01 UTC from Baikonur in Kazakhstan. Also on-board were Terry Virts and Anton Shkaplerov. They arrived at the ISS on Monday, November 24th 2014 05:00 UTC where they joined crew members Elena Serova, Alexander Samoukutyaev and Barry Wilmore. 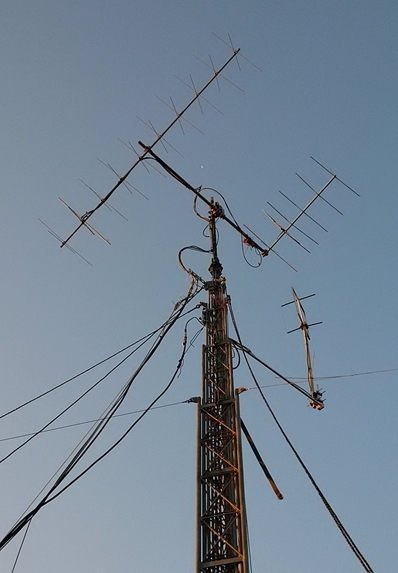 On December 18th and 20th 2014 the SSTV transmitter was activated. 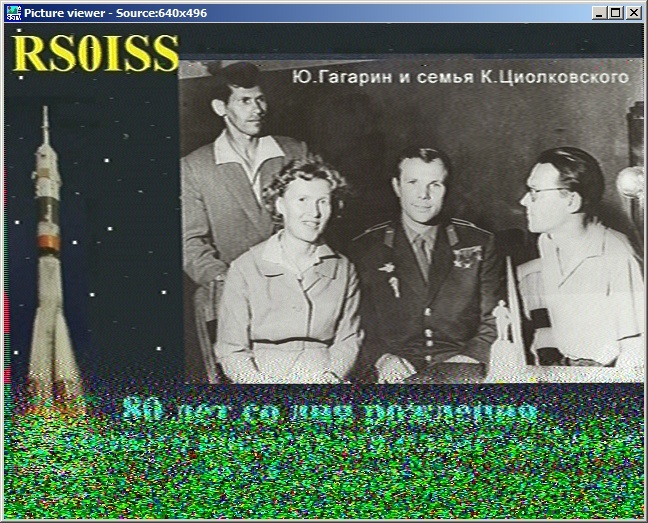 Enclosed audio recording and SSTV pictures were received on December 20th 2014 by DD1US. Jelena Olegowna Serowa is a Russian femal cosmonaut who started her first mission on September 25th 2014. On February 1st 2015 the SSTV transmitter was activated again. 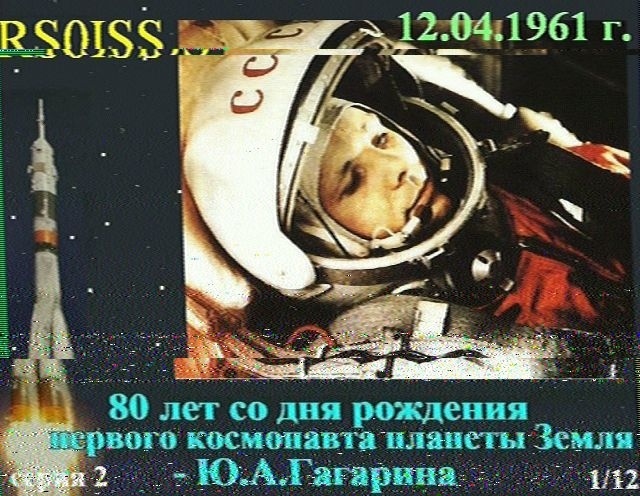 First the pictures were distorted but during the next pass at 21:30 UTC enclosed audio recording and SSTV picture was received on 145.800 MHz in FM by DD1US. 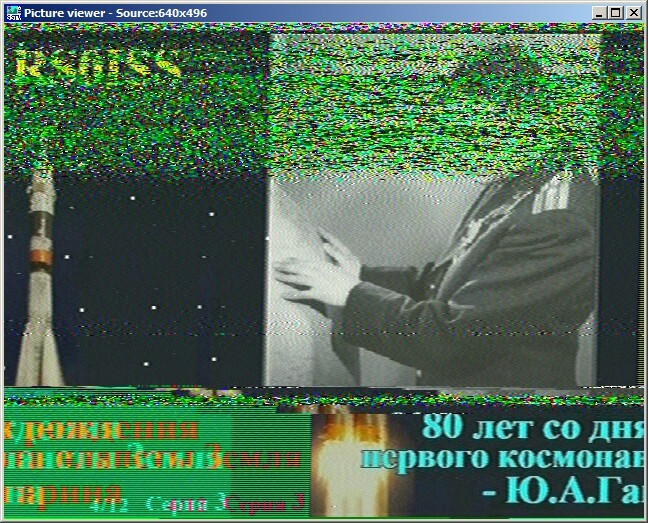 Between the transmission of the SSTV pictures was a 3 minutes pause. During that time a female cosmonaut, possibly Jelena Serowa, had a voice contact with another station. She said twice "I am RS0ISS, copy you !" then "Tamara Fedor Galya for you RS0ISS! Over!" Enclosed the downlink signal which was received and recorded on February 1st 2015 at 21:38 UTC on 145.800 MHz in FM by DD1US. 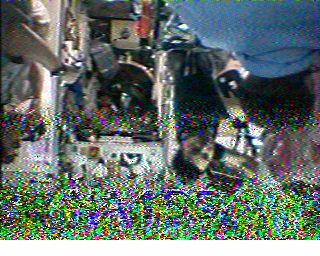 During the next pass on February 1st 2015 at 23:06 UTC another SSTV picture was received on 145.800 MHz in FM by DD1US. 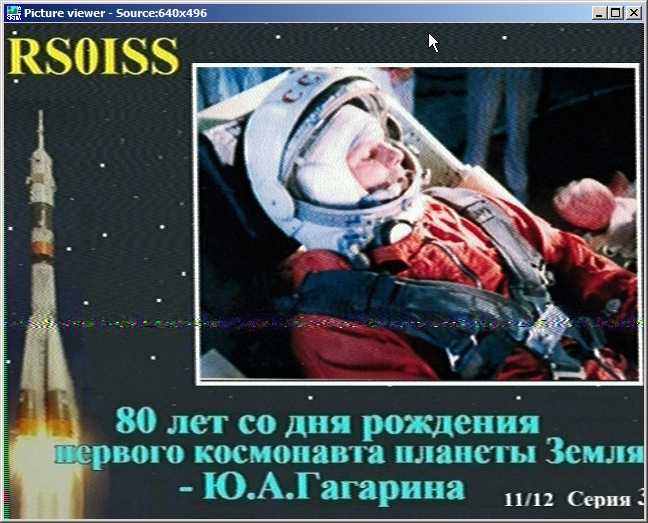 On February 22nd2015 there was another series of SSTV pictures transmitted by ISS. Enclosed pictures were oreceived during ne path which started at 12:45h UTC on 145.800 MHz in FM by DD1US. 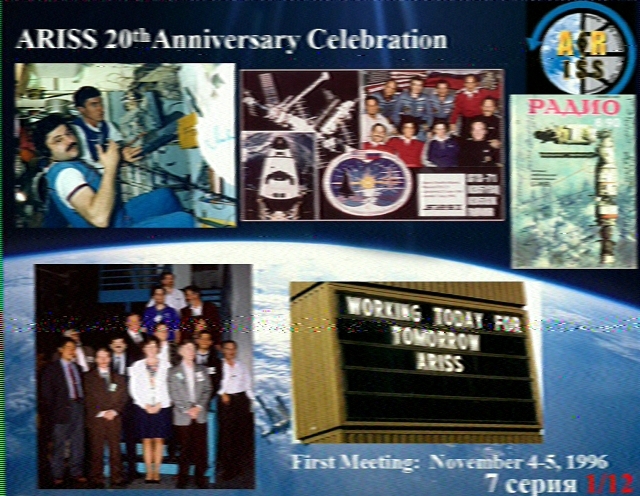 During the next pass on February 22nd 2015 at 16:00 UTC another SSTV picture was received on 145.800 MHz in FM by DD1US. 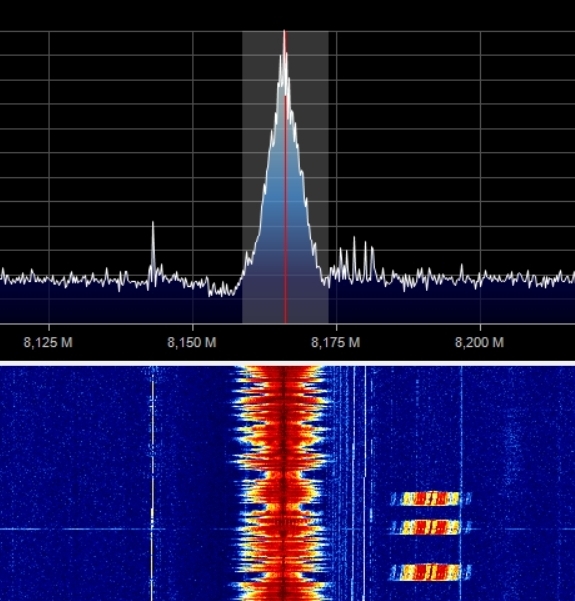 Besides the picture you can find on the right also a spectrum plot and waterfall diagram showing the SSTV transmission. Also during the next pass on February 22nd 2015 at 17:32 UTC two SSTV pictures were partly received on 145.800 MHz in FM by DD1US. Expedition 43 crew members are NASA astronaut Terry Virts, commander; along with Russian cosmonaut Mikhail Kornienko, European Space Agency astronaut Samantha Cristoforetti, Russian cosmonaut Anton Shkaplerov, NASA astronaut Scott Kelly and Russian cosmonaut Gennady Padalka, all flight engineers. On April 12th 2015 the SSTV transmitter was activated. 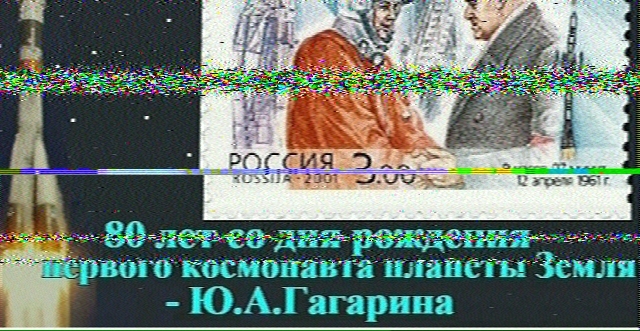 Between the picture transmissions also random QSOs from a Russian cosmonaut using the callsign RS0ISS were made. Enclosed audio recording and SSTV pictures were received on April 12th 2015 starting 18:00 UTC on 145.800 MHz by DD1US. 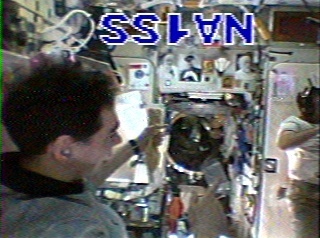 During the next pass on April 12th 2015 the SSTV transmitter was still activated. 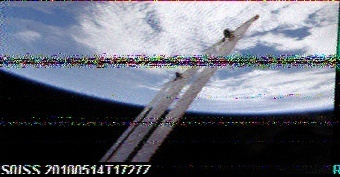 Enclosed SSTV pictures and the audio recording of the second SSTV transmission were received on April 12th 2015 starting 19:40 UTC on 145.800 MHz by DD1US. During the last pass on April 12th 2015 the SSTV transmitter was still activated. Enclosed SSTV pictures eere received on April 12th 2015 starting 21:20 UTC on 145.800 MHz by DD1US. When the crew aboard ISS is not active in phone then quite often they activate the packet radio equipment. You can then hear the downlink of the digipeater / mailbox on the used simplex frequency 145.825 Mhz. Enclosed recording of the packet radio signal was made on May 1st 2015 at 09:06 UTC by Francisco EA7ADI. 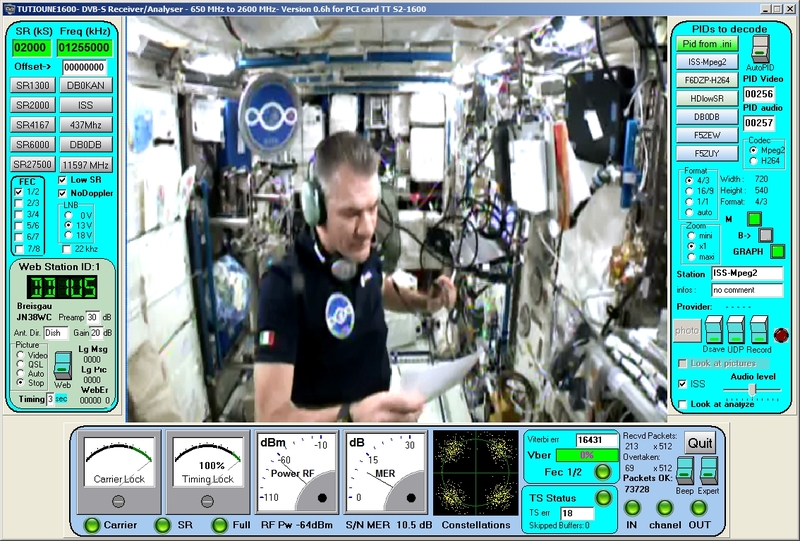 In May 2015 blank test transmissions of the DATV (Digital Amateur Television) transmitter on ISS were conducted to allow the ground stations to optimize their setup. On Saturday May 9th 2015 between 11:27 and 11:36 UTC, DD1US was able to receive the signal on 2395 MHz in DVB-S2 at 2 Msps. Parameters used were SR=2000, FEC=1/2, PIDVideo=256, PIDAudio=257, MPEG2. I used a 2.3m dish with an Arabsatconverter downconverting the signal from 2395 MHz to 1255 MHz. 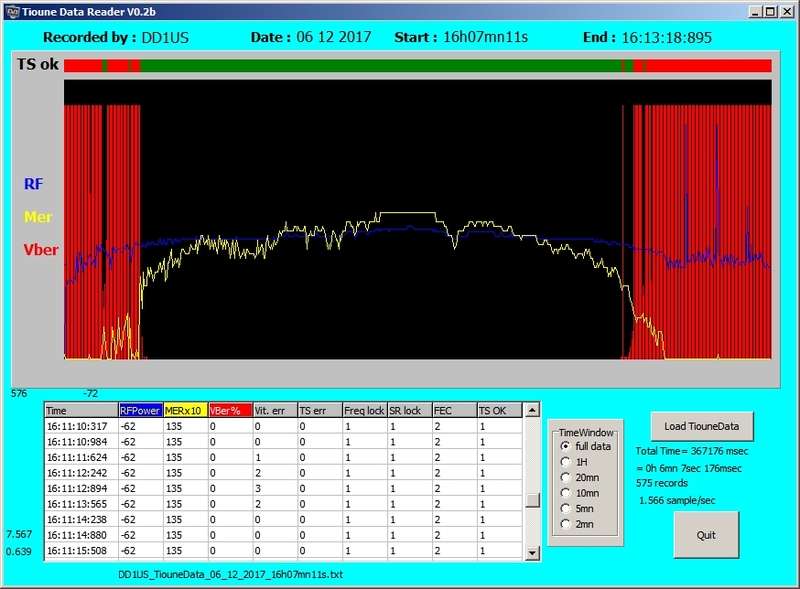 Demodulation and decoding was done with a Technotrend TT S2-1600 PC-card I was running Tutioune v0.6h with the parameters LowSR=y, NoDoppler=y, LNB=13V, ISS=y.Enclosed picture shows a screenshot of the constellation diagram and some more parameters during the reception. 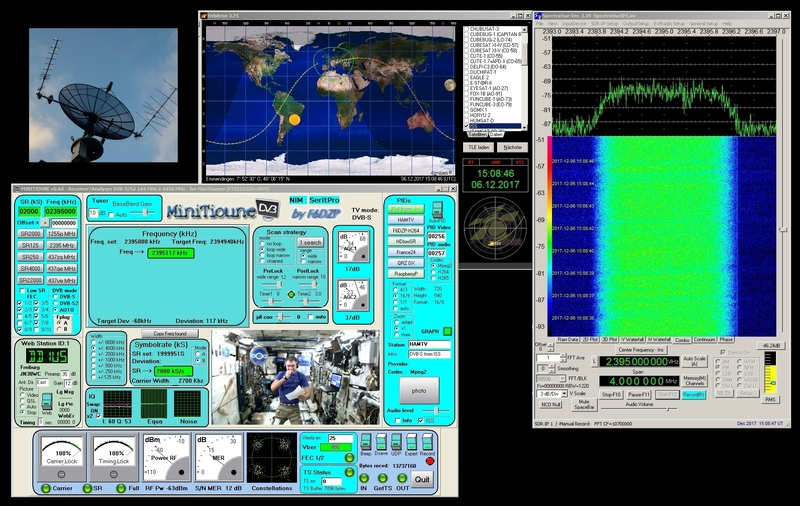 On August 8th 2015 at 17:00 UTC astronaut Kjell Lindgren KO5MOS had a school contact with Space Jam 9, Rantoul, IL using a telebridge via IK1SLD. All 24 questions got asked and answered. At Space Jam 9 about 1000 boy and girl scouts from 24 states came together in an educational and fun format. Talking to the astronaut on ISS was certainly the highlight of the camp. Enclosed audio recording (pauses removed) was received and recorded on August 8th 2015 starting 17:05 UTC on 145.800 MHz by DD1US. On September 1st 2015 at 11:38 UTC astronaut Kjell Lindgren KO5MOS had a school contact with Ulvila Upper Secondary School in Finland. Enclosed audio recording (pauses removed, first part received with FT-736, second part with AR-8600) was received and recorded on September 1st 2015 starting 11:38 UTC on 145.800 MHz by DD1US. On May 9th 2016 at 09:26 UTC GB1SS, operated by Timothy Peake KG5BVI aboard the ISS, had a scheduled ARISS school contact with The Kings School, Ottery St. Mary, Devon, UK. Recorded on 145.825 MHz by DD1US. 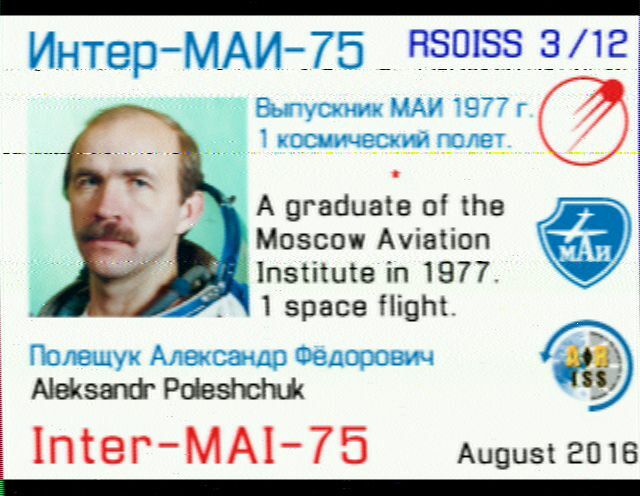 On August 15th and 16th 2016 ISS made SSTV transmissions as part of its "Inter-MAI-75" experiment. The used callsign was RS0ISS. Enclosed recording and demodulated picture was received on August 15th at 12:39 UTC and another picture on August 16th at 11:45 UTC on 145.800 MHz in FM / PD120 mode by Roland Zurmely. Recording and pictures kindly provided by Roland PY4ZBZ. 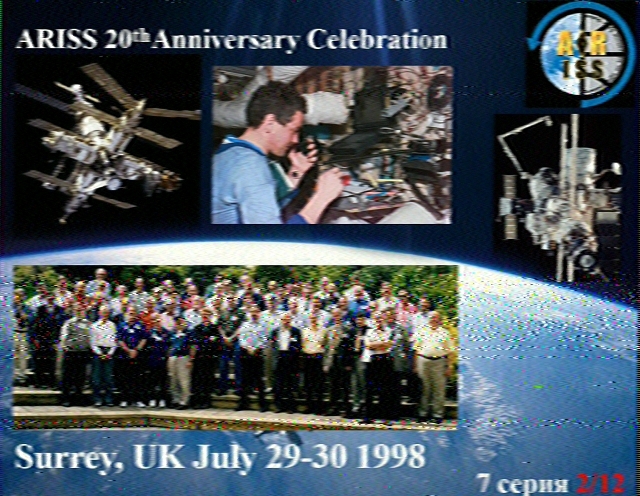 From July 22nd to 24th 2017 ISS made SSTV transmissions in memoriam of the 20th anniversary of ARISS (Amateur Radio on ISS). Enclosed recordings and demodulated pictures were received in the night from July 23rd to 24th 2017 on 145.800 MHz in FM modulation. 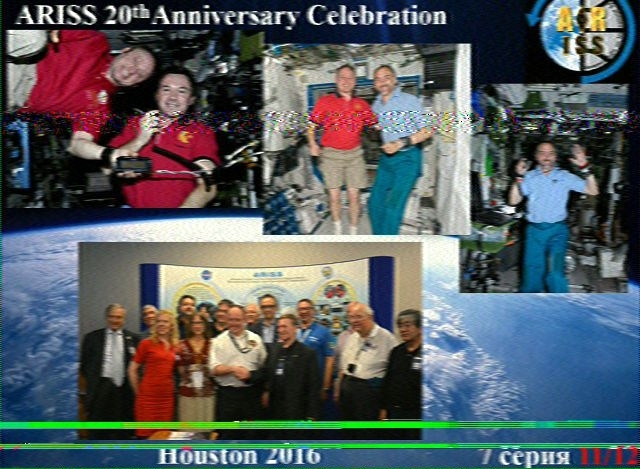 In total 12 different pictures were sent in SSTV mode PD120. I received 4 of them, please see below. The first picture was number 2 of 12 and was received on July 23rd at 21:24 UTC. The second picture was number 12 of 12 and was received on July 23rd at 23:00 UTC. The third picture was number 1 of 12 and was received on July 23rd at 23:05 UTC. The forth picture was number 11 of 12 and was received on July 24th at 00:37 UTC. 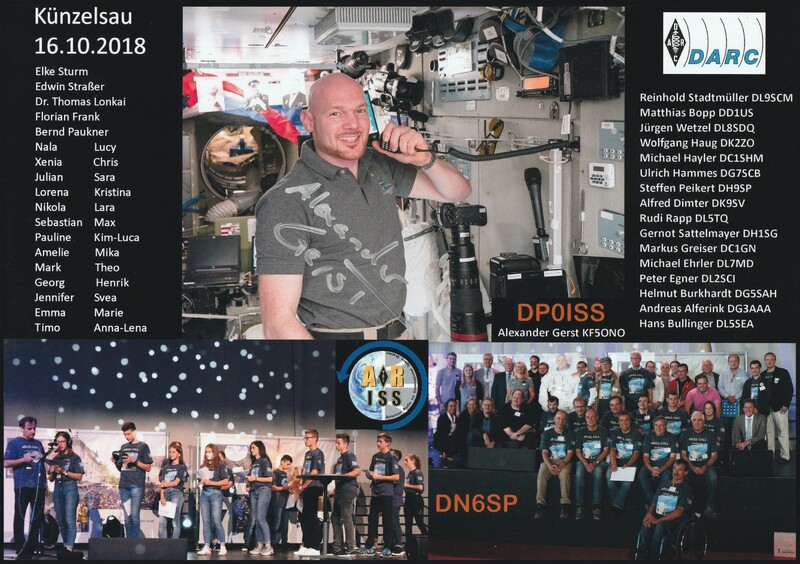 On August 1st 2017 from 18:20-18:30 UTC a successful contact was made between VCP-Bundeszeltplatz, Großzerlang, Germany and Astronaut Paolo Nespoli IZØJPA who was using the callsign OR4ISS. The contact was direct via DP9S. The ARISS Mentor was Peter IN3GHZ. Received and recorded by DD1US. 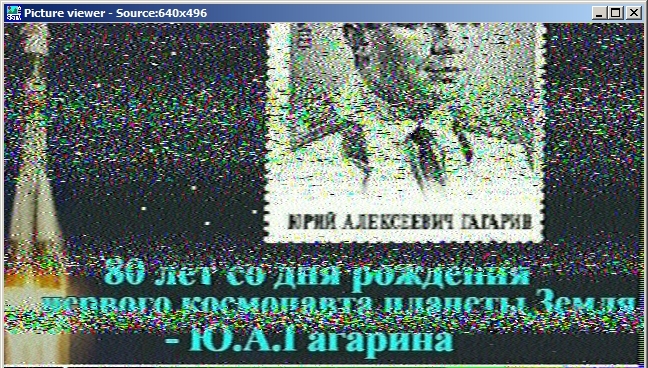 On October 14th at 12:30 UTC I received the DATV (Digital Amateur Television) transmitter on ISS operated by Paolo Nespoli. Enclosed you can find the TS video stream (24 MByte) and3 screenshots of the transmission. The reception was still not optimum (many interruptions due to fading and non perfect automatic tracking) but I am working on further improvements. Clicking on the lower left button you can get an analysis of the video signal versus time. On October 26th 2017 from 08:23-08:33 UTC Paolo Nespoli using the callsign IR0ISS had a successful contact with Beaconsfield State School, Mackay, Queensland, Australia. The contact was made using a , telebridge via IK1SLD. Received on 145.800 MHz and recorded by DD1US. On October 30th 2017 from 11:20-11:28 UTC Paolo Nespoli using the callsign IR0ISS had a successful contact with Primaria e Secondaria di primo grado Istituto comprensivo Via XVI settembre, Civitavecchia, Italy. Received on 145.800 MHz and recorded by DD1US. On November 3rd 2017 at 09:30 UTC Paolo Nespoli using the callsign IR0ISS had a successful direct contact with Liceo Scientifico ‘Francesco Cecioni”, Livorno, Italy and Liceo Artistico Melotti, Lomazzo, Italy. Received on 145.800 MHz and recorded by DD1US. On November 4th 2017 at 10:20 UTC Paolo Nespoli using the callsign OR4ISS had a successful direct contact with Istituto di Istruzione Superiore “Leonardo Da Vinci”, Lanusei, Italy. Received on 145.800 MHz and recorded by DD1US. On November 28th 2017 at 18:45 UTC Paolo Nespoli using the callsign IR0ISS had a successful contact with Huntley Centennial Public School, Carp, ON, Canada using a telebridge via IK1SLD in Italy. Received on 145.800 MHz and recorded by DD1US. On November 30th 2017 at 17:02 UTC Paolo Nespoli using the callsign IR0ISS had a successful contact with Bishop Hendricken High School and its sister school, St. Mary Academy - Bay View, Warwick, RI, using a telebridge via IK1SLD in Italy. Received on 145.800 MHz and recorded by DD1US. On October 11th 2017 from 11:48 UTC a successful contact was made between Elementary School "21st of May" in Podgorica, Montenegro, and Astronaut Joe Acaba, KE5DAR, who was using the callsign OR4ISS. 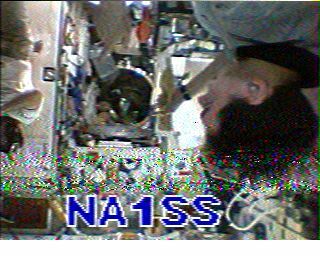 The contact with a downlink on 145.800 MHz was direct via 4O0ISS. Received and recorded by DD1US. On October 26th 2017 from 09:55-10:05 UTC Joe Acaba using the callsign OR4ISS had a successful contact with Glanmire Community College, Cork, Ireland, direct via EI1ISS and Colegiul National Calistrat Hogas Piatra Neamt, Piatra Neamt, Romania, telebridge via EI1ISS. Received and recorded by DD1US. On December 4th 2017 from 15:00 UTC Mark Vande Hei KG5GNP using the callsign OR4ISS had a successful contact with School of Telecommunications and Aerospace Engineering (EETAC), Castelldefels, Spain, direct via EG3UPC. Received and recorded by DD1US. On April 19th 2018 from 12:05 UTC Ricky Arnold KE5DAU using the callsign NA1SS had a successful contact with Kings High School, Warwick, UK, direct via GB4KHS. Received and recorded by DD1US. 1. Yasna (11): Wie verändert sich der menschliche Körper im Weltall? 2. Victor (11): Verändert sich auch Ihr Biorhythmus im All und können Sie gut schlafen? 3. Eva (17): Stimmt es, dass man im Weltraum nicht rülpsen kann? 4. Tessa (11): Welche alltäglichen Dinge und Gewohnheiten vermissen Sie am meisten? 5. Max (14): Kann man eine Kerze in der Raumstation anzünden , wenn ja wie sieht sie dann aus? 8. Lorenz (16): Haben Sie schon einmal etwas außerhalb der ISS verloren? 9. Max (17): Was halten Sie von der Entsorgung von Müll , z. B. von Elektroschrott , im Weltraum? 10. Sven (17): Was würden Sie einen Astronauten fragen, wenn Sie selber nicht Astronaut wären ? 11. Charlotte (13): Wie sauber ist die Luft auf der ISS, muss man Staubwischen ? 12. David (13): Womit hat Ihr Assistent CIMON Sie am meisten überrascht ? 13. Linda (11): Wie fühlt es sich an, einen Raumspaziergang zu machen? 14. Lorent (11): Was war das Außergewöhnlichste , was sie im All erlebt haben? 15. Anna (18): Wie schwer ist es, sich nach einem längeren Aufenthalt im All wieder an das Leben auf der Erde zu gewöhnen ? On July 3rd 2018 from 08:35 UTC Alexander Gerst KF5ONO had another successful school contact, this time with Kardinal-Frings-Gymnasium in Bonn, Germany. Received and recorded by DD1US. 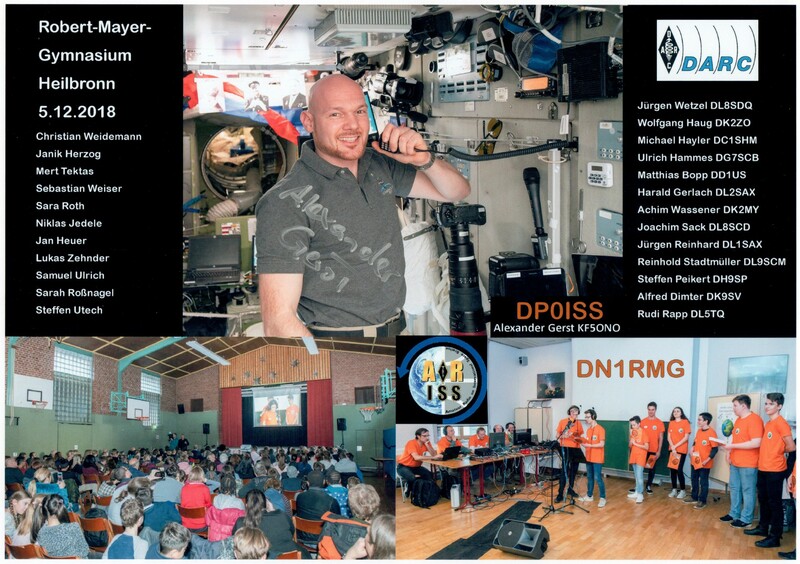 On August 14th 2018 from 13:00 UTC Alexander Gerst KF5ONO had another successful school contact, this time with DLR_School_Lab Braunschweig, Germany, direct via DN2DLR. Received and recorded by DD1US. On August 25th 2018 from 09:55 UTC Alexander Gerst KF5ONO had another successful school contact, this time with Friedrich-Franz-Gymnasium Parchim, Parchim, Germany, direct via DC1RSN . Received and recorded by DD1US. About 50 years ago the local ham radio club of Künzelsau (DARC P33 Hohenlohe) was cofounded by the grandfather of Alexander Gerst. His grandfather who is SK had the callsign DK1LC. On August 26th 2018 from 12:38 UTC a team of radio amateurs around the club station DK0KU in Künzelsau had a nice contact with Alexander Gerst who was using the callsign DP0ISS. Operators were Alfred DK9SV, Rudi DL5TQ, Markus DC1GN and Matthias DD1US. Recorded by DD1US. 1. Nala: Sie koennen die Auswirkungen des Jahrhundertsommers sehen. Was muss aus Ihrer Sicht gegen den Klimawandel getan werden? 2. Xenia: Gibt es neue oder ueberraschende Forschungsergebnisse aus den Experimenten, welche Sie bei Ihrem Aufenthalt auf der ISS durchfuehren? 3. Julian: Warum ist es in Zeiten globaler Herausforderungen wie Armut und Naturkatastrophen so wichtig, so viel Geld für Raumfahrt auszugeben? 4. Lorena: Was hat Sie als Astronaut am meisten beeindruckt? 5. Nikola: Werden Pflanzen auf der ISS angebaut? Können Pflanzen auf der ISS wachsen? 6. Sebastian: Im November werden Sie den Photobioreaktor testen. Wird in der Zukunft Leben im All moeglich sein, wenn Kohlendioxid erfolgreich in Sauerstoff umgewandelt wird? 7. Pauline: Ist Krafttraining in der Schwerelosigkeit genauso anstrengend wie auf der Erde? 8. Amelie: Wie schnell kann man die ISS verlassen, wenn es etwas schieflaeuft oder Schwierigkeiten auftreten? 9. Mark: Ist es jemals vorgekommen, dass ein Astronaut auf der ISS ernsthaft krank oder verletzt wurde und wie wurde damit umgegangen? 10. Georg: Welches sind Ihre deine drei wichtigsten Erfolgsregeln? 11. Jennifer: Man befindet sich mit wenigen Menschen auf engem Raum. Gibt es auch einmal Streit und wie gehen Sie damit um? 12. Emma: Welcher Ort oder Raum auf der ISS wird am meisten genutzt und warum? 13. Timo: Sehen Sie die Verschmutzung (Müll) im All und auf der Erde? 14. Lucy: Haben Sie Probleme beim Schlafen im Weltall bzw. in der Schwerelosigkeit? (8.215 MHz) of the K3 transceiver which was fed by a Kuhne transverter. On the waterfall display you can also see the PR beacon of the ISS operating in parallel on 145.825 MHz. 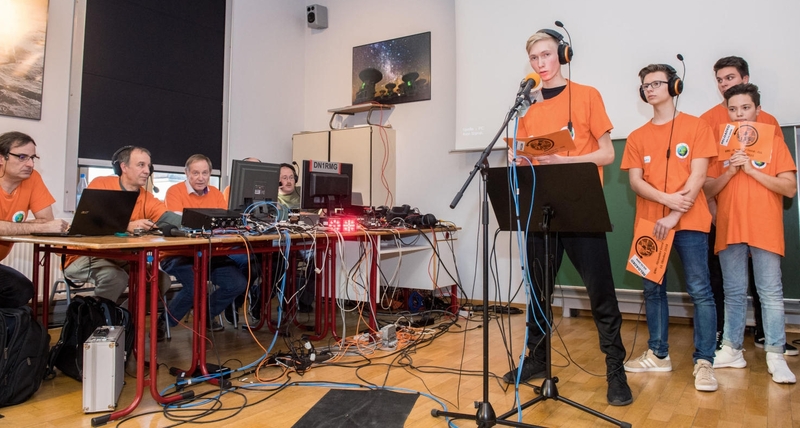 On December 5th 2018 we had another successful ARISS-Call with Alexander Gerst DP0ISS. The contact was conducted from 2 locations, Robert-Mayer-Gymnasium, Heilbronn, Germany using the callsign DN1RMG and Realschule & Gymnasium Weingarten, Weingarten, Germany using the callsign DN2RV. Both locations had setup up their own ground station. Alexander Gerst answered 17 questions from the students. 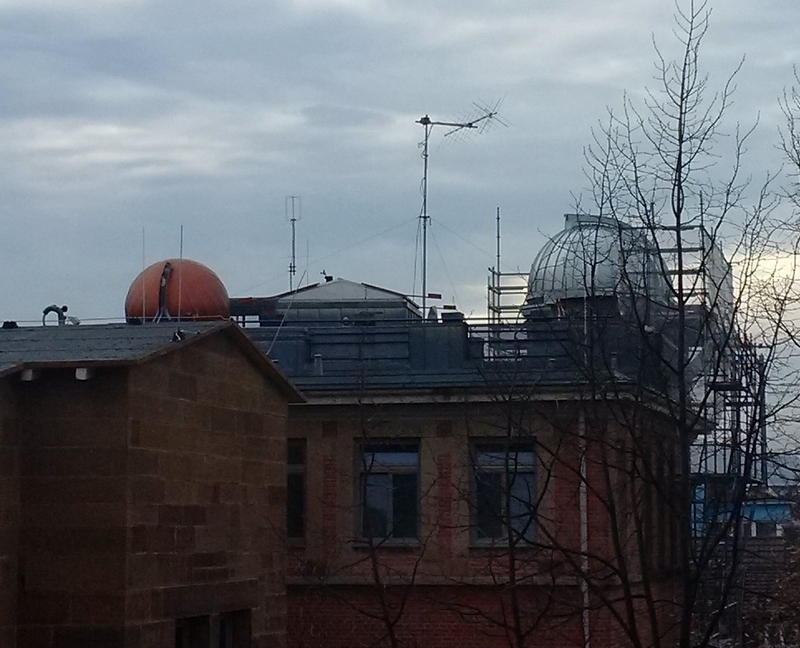 The ground station in Heilbronn was and operated by members of DARC OV P05 (Heilbronn) and OV P33 (Hohenlohe). The recording was made by DK2ZO at DN1RMG. We had in the background a telephone connection to Weingarten. The signal strength was excellent as you can see in the spectrum and waterfall display enclosed. On August 22nd 2018 starting at 09:15 UTC a scheduled contact with school children from the Novgorod Region, Russia, was not successful. I heard only the Russian Cosmonaut Sergei Prokopjew calling on 145.800 MHz. Received and recorded by DD1US. On November 24th 2018 starting at 19:05 UTC a scheduled contact of astronaut Serena Maria Aunon-Chancellor KG5TMT with students from IMP Aerospace & Defence, Goffs, NS, Canada was telebridged by IK1SLD. Received on 145.800 MHz and recorded by DD1US.